Most of the 2000s saw an influx of sustainable architecture, with designers turning their focus on ways to create buildings with a smaller carbon footprint. This wasn’t just a passing fad though— sustainable architecture still plays an important role in today’s infrastructure as planners seek designs that can help the Earth and save energy costs for the long term. For the AV industry, jumping into these green initiatives was a bit of a scramble at first, but now consultants have found a way to help companies design sustainable AV solutions without spending too much money. Back in 2010, InfoComm, along with CompTIA and TIA, created the STEP Foundation as a way to promote technology sustainability in the built environment. The associations wanted to showcase how technology could contribute to, rather than detract from, sustainability. However, the foundation currently remains in a dormant stage, according to a statement from InfoComm. The statement reads: “The goals of the STEP Foundation, while well-intentioned, have not been entirely fulfilled. While there were several wonderful STEP demonstration projects, the program itself became financially unsustainable due to a variety of market forces, including a sluggish economy, less reliance on environmental rating systems, and competitive pricing pressures in the building space. Rather than continue to make significant contributions to support the foundation on an annual basis, the associations involved have elected to suspend the foundation’s activities indefinitely. But even without the STEP program, there is still a future for sustainable AV. For example, Walker sees a need for sustainable AV solutions in meeting rooms, creating solutions that allow users to schedule meetings properly. “These solutions help users find the right space, set the room to their standards, and get it ready for when they arrive. It also allows the owner to get reports and see how efficiently the rooms are used—what rooms are booked but users are not showing up,” Walker explained. Mobile devices are also a key component in sustainable AV, as they help users monitor and control settings in the room to meet green standards. The Green Building Initiative recently released a revision for its American National Standard, known as ANSI/ GBI 01-2010: Green Building Assessment Protocol for Commercial Buildings, which is now open for public comment. 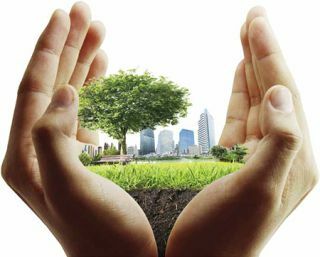 The nonprofit organization is dedicated to accelerating the adoption of green building practices. This revision includes input to date from nearly 100 subject matter experts in the green building community through more than 50 public meetings and calls conducted as part of GBI’s American National Standard Institute (ANSI) approved procedures. The procedures dictate requirements for openness, balance, consensus, and due process. The ANSI/GBI 01-2010 Standard forms the basis for the current version of Green Globes for New Construction (Green Globes NC), which was released in 2013 and is delivered through an interactive online platform, which breaks down the criteria into questionnaires and links users to online reference materials. The current Green Globes NC was also updated to include criteria from the Federal government’s Guiding Principles requirements. Additionally, updates were made to respond to customer feedback and incorporate changes that occurred in the market between 2010 and 2013.